I am perhaps the worlds worst networker. Maintaining professional, personal and family relationships takes a lot of effort and time. 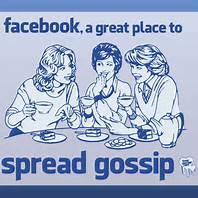 I do not consider myself nosey or a much of a gossip. Frankly, I really could care less what other people are up to, unless it impacts me somehow. So recently, when a friend mentioned to me that a mutual acquaintance was a bit perplexed about receiving a friend request from me on Facebook, I was taken back a little. It was someone that Facebook suggested I befriend because we had dozens of mutual contacts. Someone who enjoys a public profile and I was interested enough in what they say to learn a little more. The experience was enough for me to reflect a little on why I use Facebook, what is its purpose in my life is and who my "friends" are. First off, all of my Facebook "friends" would not be considered "friends" in the non-digital world. The majority of those I have connected with are acquaintances. The rest are friends from various stages of my life that I have connected with and occasionally think of. Facebook allows me to sort of keep up. It is a lot like a digital shopping mall where you bounce into people you have not seen a while. Say hi, catch-up and be on your way. I don’t go searching for folks to add as friends, but on the rare occasion that I stumble on a comment that shares a word view I like, and we have mutual friends, I might make a friend request. I do not log into FaceBook every single day. I do not have alerts that let me know when my feed has been updated or when a message has been posted. I do not log in just to see what others are doing or over share with the entire world. I check in a few times a week to check messages and friend requests. I like to read my feed for interesting articles, jokes and funny images. For example, one of my the most read "friends" on my list is a guy that I have never met. He posts a funny joke every day. I rarely log in without checking out his feed for jokes. I comment and implore him to keep them coming. He is an acquaintance at best. I have often had a comment, picture, video or photo re-directed my way that led me to sending a friend request because a person is interesting. I repost the scattered blog post, news article and a few family pictures. 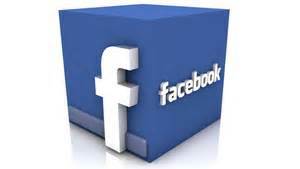 My chief reason for using Facebook is to look for stories that interest me, funny videos and good links. Sometimes, I use it to procrastinate - checking in on family and friends. Perhaps, I should be doing more of this but I know my limits and avoid being sucked into the time wasting vortex. My friends list reflects a lifetime of friends, lots of acquaintances and more than a few strangers whose worldview interests me but I would not want to give anyone the impression that I am remotely interested in what they do. I am more interested in what you say and to whom. Your influence on others is what interests me. I like the fact that Facebook allows me to keep in touch, re-connect and help make the occasional new friend. I love the fact that through sharing, it opens up a plethora of entertainment, news and opinions that help inform my worldview. 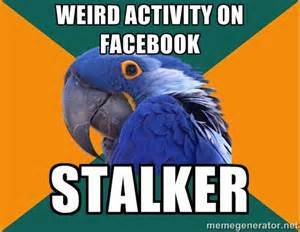 If you are inclined to be paranoid or suspicious of others, perhaps Facebook is not for you! Remember, aliens are you using the hidden cameras in your tv, computers and cell phones to monitor you!